This is the last photo we have of my aubergine-colored cardigan. I know it may not look like much, but it was the perfect length, a great color, and had lovely details like small mother-of-pearl buttons. I wore it constantly--over everything from white tees and jeans to sundresses--in all kinds of weather. 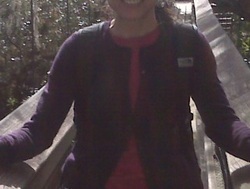 Here I'm wearing it on a December visit to Florida--the perfect lightweight layer. I don't know where I lost it, but for weeks afterwards, I was searching. I dug through the enormous lost and found bin at Anthropologie (had I left it in a dressing room?). I went back to a restaurant where we'd had dinner before a movie and then to the theater, doing my best to describe its unique color. At the restaurant they brought out a poor substitute, some complicated pink-ish number, not my classic, simple cardigan. I've occasionally seen a similar cardigan but not the same length, never quite the same.